In view of most of our customers' feedback that the 1500 Lumens or 1800 Lumens projector can not satisfy their need. So that TENKER has upgraded the brightness of this projector with 30% more Lumens to offer our customers higher cost-effective product. * A Wireless HDMI Dongle (not included) is required if you want to connect the projector to smartphones (which support MHL) and tablets. For Android phones, you need an MHL to HDMI cable. For iPhones & iPads, you need a Lightning to HDMI cable adapter. * To connect the mini video projector to PCs or laptops, please adjust the PC/laptop display resolution to 800*600 or 1024*768, which provides the best clarity. * Dolby is not supported. If there's no sound, please turn off Dolby Digital in Netflix，Apple TV, Blu-Ray players and Fire Stick etc. * The cooling fan speed will adjust according to the temperature of the projector, therefore the sound of the fans will vary at different times; this is normal. 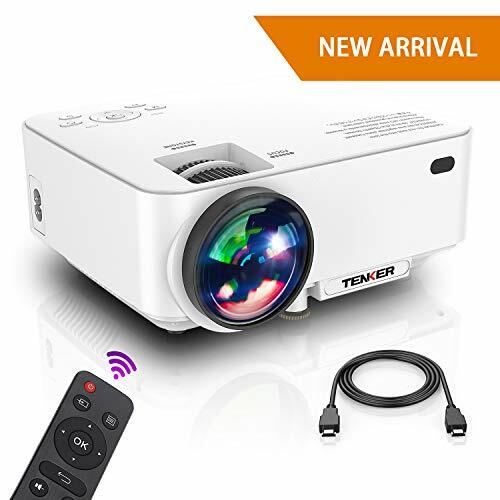 UPGRADED WITH 65% BRIGHTER IMAGES: The TENKER T20+ video projector takes the latest in LED technology and brings you high definition display images. A contrast ratio of 2000:1 and native resolution of 800*480, supporting resolutions up to 1080p, make this ideal for home entertainment in dark. NOT RECOMMEND for PPT or business presentations. ADJUSTABLE PROJECTION SIZE: This portable projector displays images between 32 - 176 inches, with a projection distance of 1-5.2m. For optimum viewing, placing the projector at a distance of 1.8 to 2.0m, while adjusting the focus and keystone correction, will achieve a super-clear and bright projection. MULTIMEDIA VIDEO PROJECTOR: This projector is compatible with TV Box, Amazon Fire TV Stick, PCs, Laptops, Tablets, Speakers, Chrome Book, Blue-ray DVD players, SD Cards, USB Flash Drives, Media players, iPads, iPhones and Android Smartphones . NOTE: When connected with smartphones, a Wi-Fi display dongle or HDMI adapter (not included) is required. UPDATED COOLING SYSTEM: Thanks to continued improvements in development, this 4.0" LCD projector adopts pure copper tube cooling technology and the turbo fan is more powerful yet quieter. This translates into less distraction for you when viewing movies or playing games. AFTER-SALES SERVICE: Backed by a 3-year warranty, you have nothing to lose by purchasing this projector. Professional customer service & technical support is available. If you have any problem or questions with your purchase, please feel free to contact us anytime! View More In Presentation Products. If you have any questions about this product by TENKER, contact us by completing and submitting the form below. If you are looking for a specif part number, please include it with your message.